Apple Books For Kids - These books about apples for kids are perfect for planning an apple unit study. Your kids will love these fun fiction and non-fiction books! Are you planning an apple unit study to do with your kids? Than you will love these apple books for kids! I love doing hands on lessons with our kids and we look forward to taking a trip to local apple orchards each fall to pick apples. They have so much fun picking and tasting many different varieties of apples. Then we all work together to make lots of applesauce and other apple treats. This is my favourite applesauce recipe, it’s so easy to make! 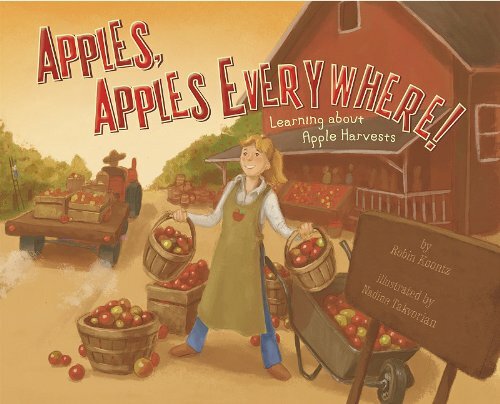 If your thinking about learning about apples this fall your kids will love these fun books! I’ve rounded up our favourite fiction and nonfiction books about apples that make planning a unit study easy! These books will teach kids about the lifecycle of apple trees, how apple cider is made, the history of how apple trees came to North America. Don’t forget to grab my free apple sorting activity, it’s perfect for toddlers and preschoolers! This is a cute story for kids about 2 children who visit an apple orchard and learn all about how apples are harvested in the fall. 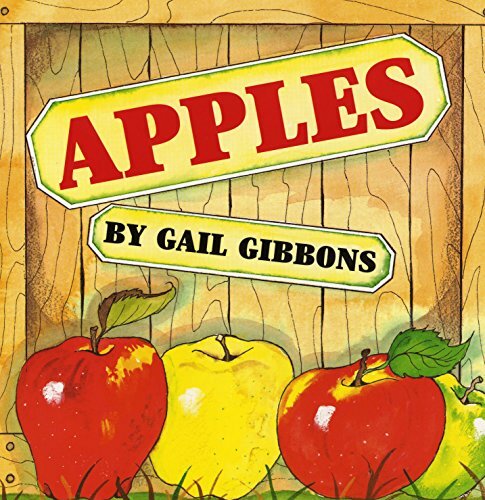 I’ve always loved Gail Gibbons books and her Apple book for kids is a great book to teach young kids all about growing apples. 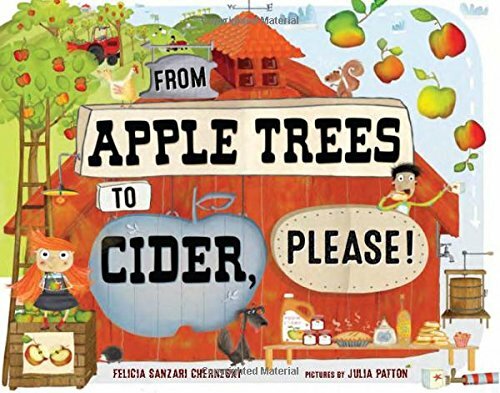 This book covers how apple trees were brought to north america, history facts about apples, how to plant and care for an apple tree and many types of apples that you can enjoy. How Do Apples Grow is a beautiful apple book for kids! It’s filled with gorgeous illustrations of apples and trees. I love how all the parts of the flowers and buds are labeled. 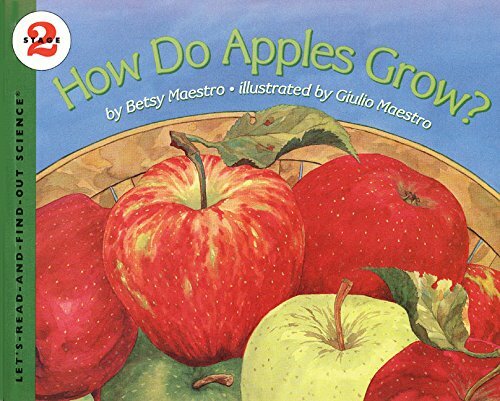 This book is perfect for using in a science lesson about apples with your kids! 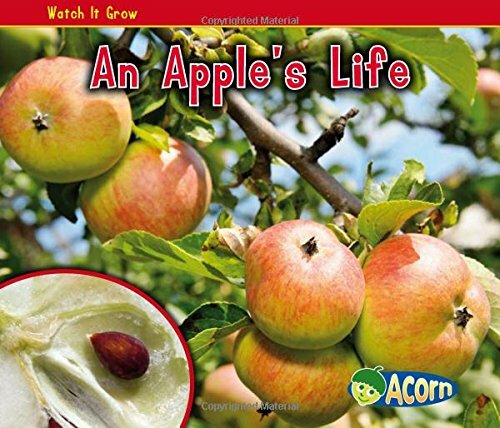 An Apple’s Life is a cute book for young children all about how apples grow. It follows the growth of an apple from seed, to seedling, to tree, to an apple. 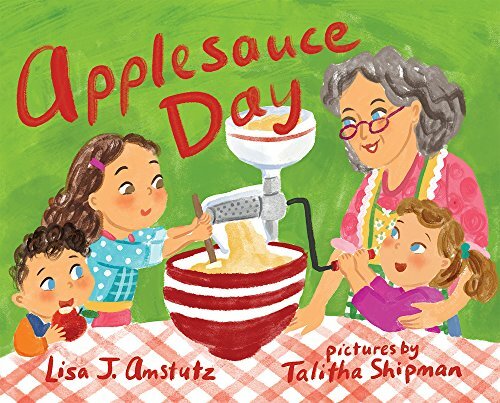 Applesauce Day is one of my favourite apple books for kids! In this story the family visits an apple orchard to pick apples and as part of their fall tradition then go to visit their grandmother for the day. Together they all work with grandma to turn the fresh apples into a yummy applesauce. 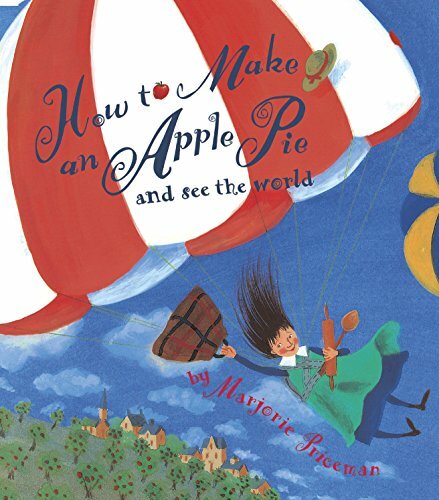 Your kids will love the book How to Make an Apple Pie and See the World! While it’s not really about growing apples it follows the funny story of a girl who wants to bake an apple pie but the store is closed. She travels all around the world to gather the ingredients just so she can make her apple pie. It includes a really good recipe for apple pie too! 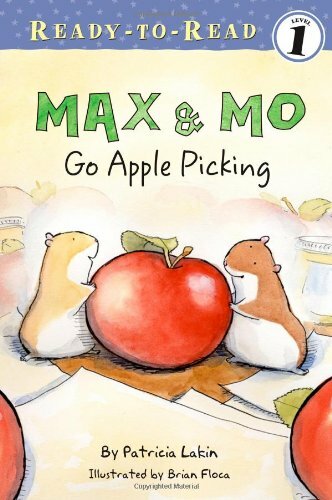 Max & Mo Go Apple Picking is such a cute book for young children and early readers! In this story Max and Mo are two little hamsters that live in a classroom. They are very tired of eating just corn. After seeing a sign about apple picking they sneak out of their cage to do some apple picking of their own and enjoy some applesauce too! 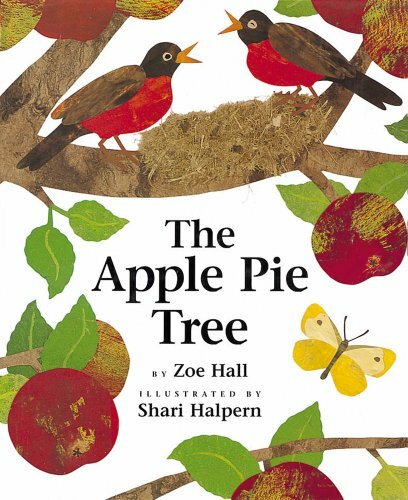 This is a fun story for kids about how apples form. Two children follow the apple tree as it progresses through the seasons from blossoms to fruit. They also learn how bees help the apple tree and how it provides homes for birds. 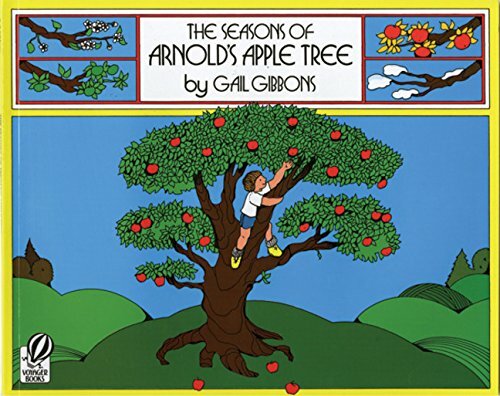 Yes, another apple story book from Gail Gibbons! This story is a must have apple book for kids. It follows a boy named Arnold as he has fun playing in his apple tree through the year. In the spring Arnold collects pretty apple blossoms, in the summer he builds a tree fort in his apple tree, than in the fall he makes apple pie and apple cider. The book includes a recipe for apple pie and shows your kids how a cider press works. From Apple Trees to Cider, Please! is a story about a little girl and her mother who go apple picking. Then they make lots of apple cider for the apple festival on the apple farm. Told in a fun rhyme kids will love this story that shows them how apple cider is made. The Apple Pie That Papa Baked, is a play on the story The House That Jack Built in the way that it is told. 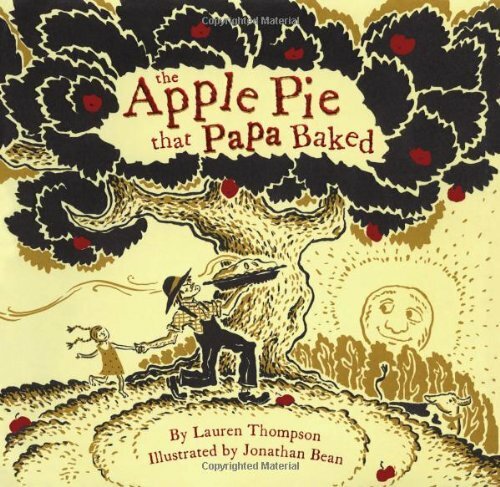 This story is a fun repeating rhyme about a father who uses yummy apples to bake an apple pie for his daughter. 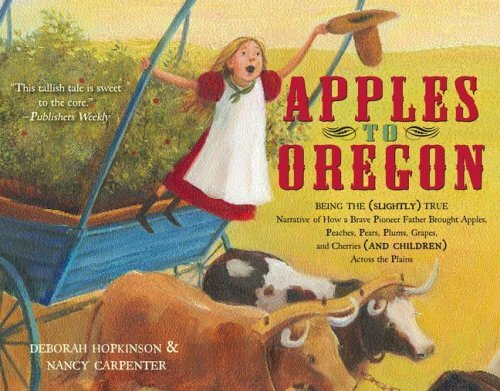 Apples to Oregon is the story of family who decides to move from Iowa to Oregon but Papa just can’t leave all of his apple trees and other fruit trees behind. This is the story of how their family traveled the Oregon trail and all the crazy things that happened to them while trying to take the fruit trees along. This is a fiction story but it’s loosely based on the true story of Henderson Luelling, a pioneer man who really did travel to to Oregon with his plants and fruit trees in 1847! 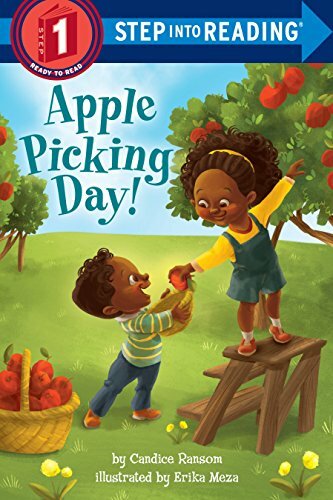 Apple Picking Day is a fun early reader for kids. In this story a brother and sister take a trip to an apple orchard, to pick apples of course! You just can’t do an apple unit study without learning about Johnny Appleseed! 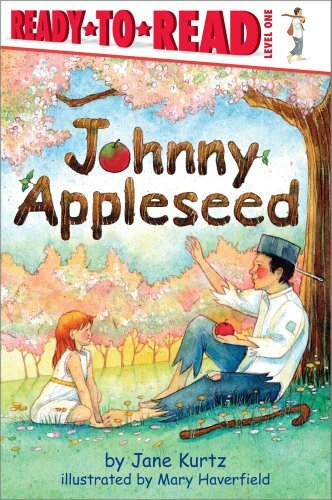 This book tells the story of Johnny Appleseed for kids and is an early reader. It’s perfect to read to toddlers and preschoolers or to use as reading practices for young readers. 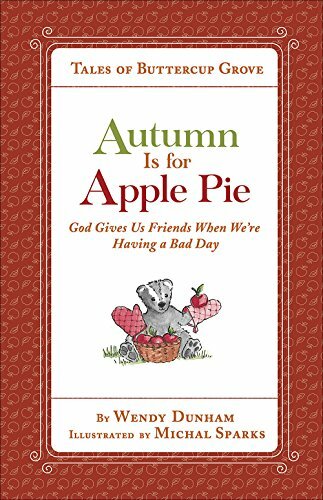 If you loved the Tale of Peter Rabbit or Winnie the Pooh you will love the Autumn is for Apple Pie story! In this sweet story skunk and racoon work together to make their first apple pie. What are your favourite apple books to read to your kids?